This all relates back to the frame – an equally important component in any window and door system. The frame can greatly affect the actual energy efficiency of any window and door – including that of double glazed systems. Plus, efficient wall and ceiling insulation will make an even bigger difference to the overall insulation of your home, office or building. Standard aluminium is a good conductor of heat and cold meaning that you can lose or gain a great deal of heat through the frame of the window/door. This can ultimately undermine the performance of double glazed windows. A thermal break needs to be added to the frame. 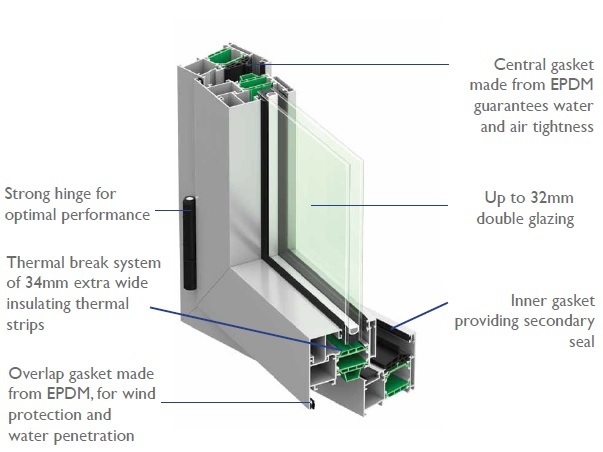 Thermal break technology features a reinforced polyamide bar between the inside and outside aluminium profiles, creating an insulated barrier within the window frame. This will conduct heat, cold and noise a thousand times slower than standard aluminium. By installing thermally broken double glazed windows and doors, you will be able to stop noise by up to 80% and keep your home cooler during the hot Queensland summers. Winsulation is the only Queensland fabricator of the Thermeco thermal break profile which is manufactured in Australia for local climatic conditions. Sections can be anodised or powdercoated with a durable surface coating that can withstand the harsh Australian climate, including UV damage and salt corrosion. Thermeco gives the flexibility to combine different internal and external window finishes, with over 200 colour combinations available. Why not compare the benefits of uPVC windows and doors and then decide which option would be the best for your home or building. Next Next post: Winsulation Celebrates 20th Birthday with 20% Off!